Do you need a last minute gift idea? Did you know you can purchase a Groupon gift card? This would make a great gift or stocking stuffer. 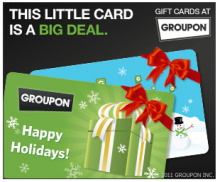 Head over to Groupon here and get your gift card and see some of the great deals they have to offer. Groupon is FREE and easy to sign up for. It’s the largest daily deal site out there with something for everyone! 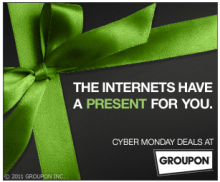 Groupon: More Cyber Monday Deals Available! Groupon just released even more hot deals. Head over to Groupon and check out all of the new Cyber Monday deals available. Offers Nov 28, 2011 in CyberMonday, Groupon · Expired! Here is a great Cyber Monday Groupon for you! Get a Sony Bloggie Touch MP4 Camera for only $94! This is a $179.99 value. Offer valid for US residence only! Limit 2 per person, may buy 2 additional as gifts. Online only. Not valid for shipping to PO or APO addresses. Cannot redeem Groupon until order is processed on Wednesday, 11/30. Must redeem by 12/28/11 or customer will be automatically refunded. All returns must take place within 30 days of order date. Allow 7-14 days for shipping. Registration with Sony required. Applicable sales tax & shipping fees included. Subject to Sony’s terms of sale. Wow! Here’s another great National Deal from Groupon. Get a $20 Old Navy voucher for just $10! Head over to Groupon HERE and look on the side by for “More Great Deals” you’ll see the National Deal there! Limit one Groupon per person, can buy an additional as a gift. Limit of one Groupon per visit. Groupons are valid from 11/26-12/24/11. Must be used by 12/24. If you are in Arizona you do not want to miss this deal! 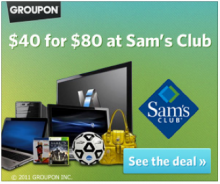 Groupon has a deal for Sam’s Club you don’t want to miss. For $40 you will get a one-year Advantage Membership package ($40 value), a $20 gift card ($20 value), one rotisserie chicken ($4.99 value), two dozen cookies ($5.98 value) and one Take n’ Bake three-meat pizza ($8.87 value) This is an $87 value for only $40! Head over to Groupon here to see the participating Arizona locations.